Actron ducted air conditioning systems are packed with useful and innovative features. This Australian brand is recognised worldwide for its reliable and energy efficient units. However, like many other brands Actron needs effective air filters to work correctly. Many people suffer from a damp or musty smell in their homes, and the problem can often be traced to an air filter. Let’s take a closer look at this problem and some possible solutions. Why is My Air Filter Damp? The air filters in our HVAC systems play an important role, and they need to be changed regularly. However, if you’re experiencing dampness and mustiness in your home, you could be surprised when you check your air filter. Instead of the usual dustiness, you may find that your old air filter feels wet and smells damp. There are a number of different underlying problems that could be causing these problems. The most common reason for a damp feeling air filter is condensation. In your home, there is a thermal interaction that occurs between the warm air and the evaporator coil in your air conditioning. The cooled refrigerant is circulated in a liquid state through the evaporation coil to absorb the heat in your home. This interaction creates condensation and dehumidifies your home. The resulting condensate is collected in a condensate drain pan and then drained away using a drainage system to carry the water out of the home. The water is kept away from sensitive electronic components in the air conditioning system. However, if a fault develops in the condensate drainage system, moisture can develop inside the air conditioning system. This will moisture will then be cycled through the system and create a damp feeling. This is a simple fix for a trained HVAC specialist. They will check for clogs or breaks in the condensate line. They will also clear and clean the condensate drain pan to ensure that it’s working correctly. This may solve the problem, but there may be other faults or leaks that need to be identified and fixed. If your system has a whole home humidifier, a control valve in your system may be faulty. This valve could be allowing saturated air to pass through your air filter. This will make the home feel more damp and humid, and it could encourage the growth of mould in the system. This will adversely affect the indoor air quality, and it is particularly bad for people with allergies and respiratory conditions. If they would like to know more about Actron air conditioning, Perth residents should contact us. 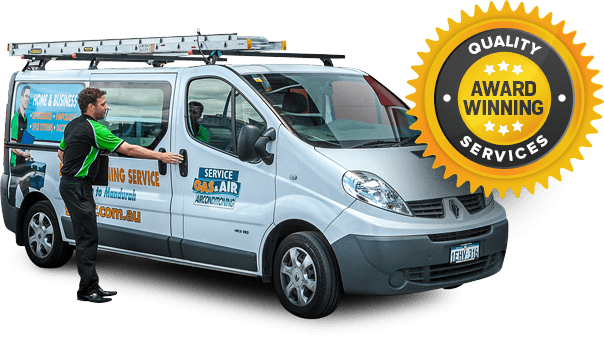 At Gas & Air, we supply, install and service a wide variety of air conditioning systems including Actron systems. Our team takes pride in the high quality of work and our attention to detail. Our sales team is standing by to answer any remaining questions that you may have.